[QODBC-Desktop] Troubleshooting : Cannot change Optimizer Settings. I can change the optimizer settings when I run the program as an administrator but it never really gets saved. Everything I run the Setup Screen again the settings are back to the original settings and my changes aren't saved. Do I really have to make the changes in the setup screen every time before I can run my application that uses QODBC? Will it never save my settings for me? Or am I missing a step to get it to save the settings? I think you have two DSN with the same name, one is User DSN & Other is System DSN. 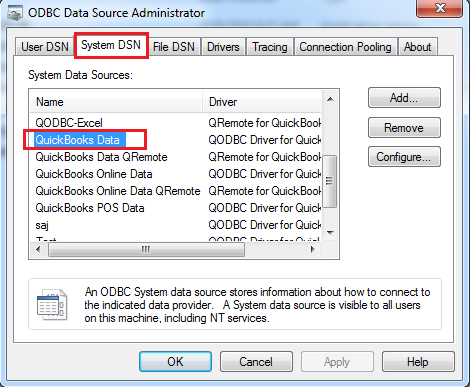 If you are modifying the DSN configuration from Start>>All Programs>> QODBC Driver for use with QuickBooks >> QODBC Setup Screen, then change will affect System DSN configuration. In this case, you need to remove one DSN. It is not advisable to use same DSN name. 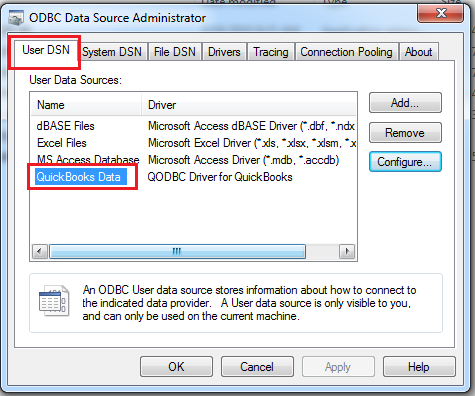 Start>>All Programs>> QODBC Driver for use with QuickBooks>> Configure QODBC Data Source>>Go To "System DSN" or "User DSN" Tab whatever you are using >> select DSN >> click "configure" & make changes as per your requirement & apply the changes.